This section of Snap Dragon is devoted to the artist Mondrian, his life, works and manifestations of his Compositions elsewhere - the Artifacts. The images below are some of my favourite artifacts and lead to further details. There is an illustrated biography here. October 2014 - what3words - *mondrian locates PM's grave in Cypress Hills Cemetery, NY (map). August 2014 - a visit to Tate Liverpool, Margate for the Mondrian and his Studios exhibition. June 2014 - a visit to Turner Contemporary, Margate for the Mondrian and Colour exhibition. June 2014 - Dean Yeagle's super homage to B323 Broadway Boogie Woogie. August 2013 - There are two PM-related projects on the cards at this time: homages to Segal's homage; and a copy of Marlow Moss's painting from the Sotheby's sale. June 2013 Marlow Moss news, a Sotheby's sale and an exhibition in St Ives. Further details here. March 2013 - Perhaps something of a cultural dumbing down compared to previous posts, nevertheless, two pairs of Mondrian sunglasses are worth a mention. On the left, from Cutler & Gross for £350 and on the right from Ray-Ban, yours for £135. Both out of my budget. 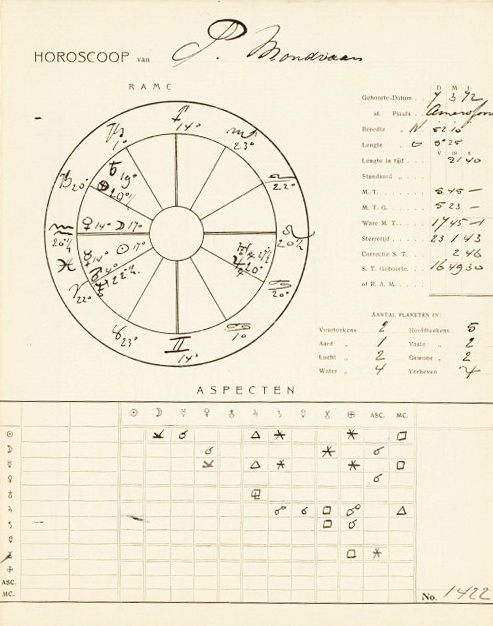 March 2013 - Mondrian's Horoscope - An interesting article by Dr. Marty Bax on horoscopes prepared by Adriaan van de Vijsel (a fellow Theosophist) in 1911 and 1912. Mondrian kept these until his death and they were recently given to Netherlands Institute for Art History as part of the Harry Holtzman Estate. Bax uses the documents to comment both on PMs circle in Amsterdam at the time and his subsequent life choices. March 2013 - Comic artist Andrew Wales has drawn my attention to a series of pieces on artists' meetings, including one featuring Mondrian and Calder. January 2013 - The Yves Saint Laurent dresses of the 60s (see the clothes page) probably contributed significantly to the growing iconic status of PM's work. One of the most elegant manifestations was the series of photographs of Isabel Eberstadt by Frederick Eberstadt . I bought one today (8th). September 2012 - B262 has been stolen as part of a $10M haul from the Santa Monica home of financier Jeffrey Gundlach. It was recovered a few days later after a $1M reward was offered. August 2012 - Mondrian Pastiches, books playing with the works of various artists, most of which include a Mondrian. A new page here. August 2012 - Where are they now? The locations of all Mondrian's paintings are listed here. July 2012 - I am reliably informed that Mondrian, while living in The Netherlands, had a pet dog. More details here. In a reorganisation, all the Artifacts have been moved to a separate section and categorised. 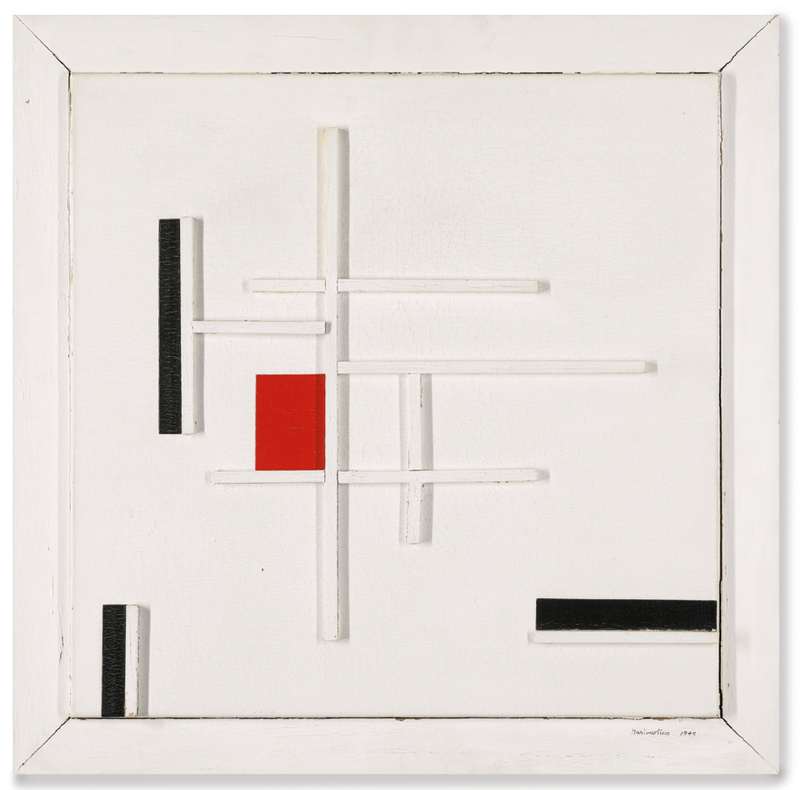 Homage contains art works influenced by Mondrian. The Pictures - "All" the Pictures - now complete. The Collection display has been boxed but is commemorated here. I have been marking items which are in my collection with the symbol o. A friend from Holland has sent me a number of scans from her collection and I will mark them thus, o. Any other contributions to this virtual collection gratefully received - just send a scan or photograph and some details - you can choose your symbol and any colour, as long as it's not green. 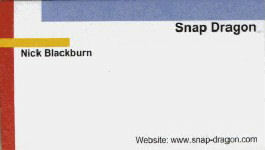 Mondrian's business card and mine, from vistaprint.